and I thought it would be fun to show you guys my "Back To Cool", not school....jewelry picks! These can help brighten up your school day, work, day or just make you feel cute while you shop for groceries or clean your house! which I love because they have more unique clothes and accessories than your average store. And everything is pretty wallet friendly. Most everything is around $10! 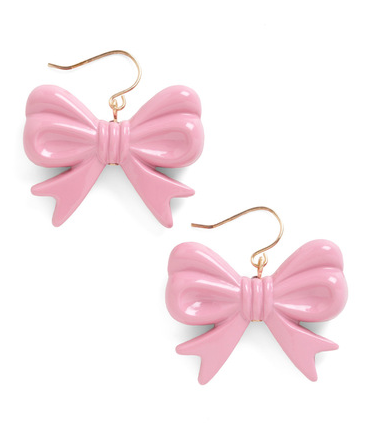 Bow Earrings- because bows will always be cute and girly- and these are not super dangly! 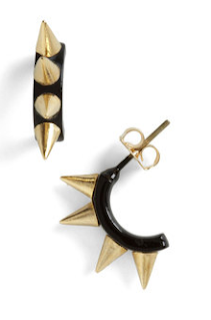 Add some edge with these spike earrings- whether your chic or punky these are awesome! 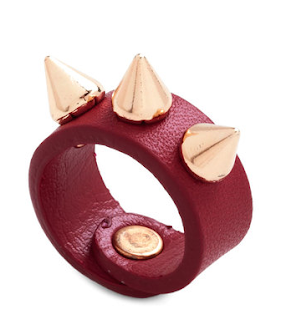 Spike It Ring- soft leather ring with cool spikes. Turquoise Spike Necklace- I love me some turquoise- and this would look cute with jeans and a t-shirt or a cute way to dress up a floral dress or tank top. 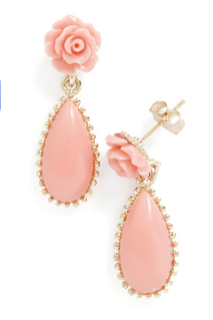 Peach Rose Drop Earrings- kind of like a way more affordable version of the Prada Rose Earrings- these can be classically romantic or can add some girl romance to a rough and rugged look. 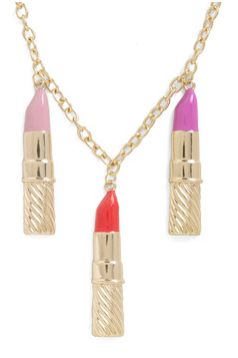 Lipstick Necklace- this was just too awesome not to show you guys! Make-Up lover jewelry for sure! 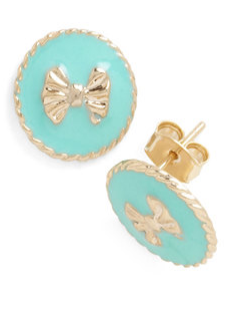 Turquoise Bow Cute Earring- I love this "Tiffany Blue" color and the little gold bow is so adorable! 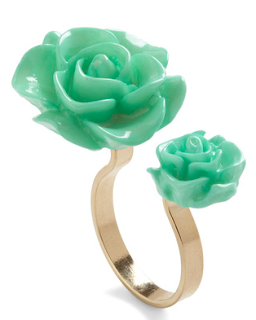 Rose Ring- You know how I love my old rose ring, and this is a new twist on a rose ring. It comes in light blue and black too! But something about this green makes my eyes happy! 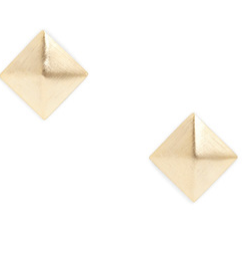 Little Gold Stud Earrings- because they will just go with everything. Vintage Rose Banana Yellow Rose Earrings- these are happy, vintage (which I love), sweet and just adorable. 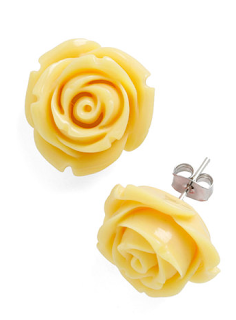 These are a classic earring in a dreamy yellow that will brighten any day, or ear! 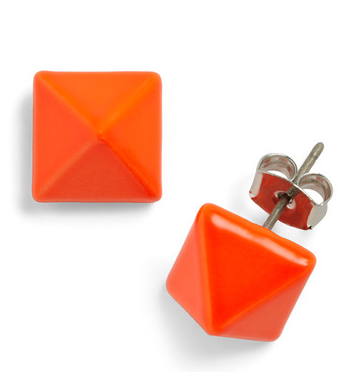 Orange You Glad I Put These Stud Earrings On- I love studs, and I love orange- these pop of color studs are awesome! Whether you wear all black or you are as colorful as a rainbow- these are lightweight and awesome! 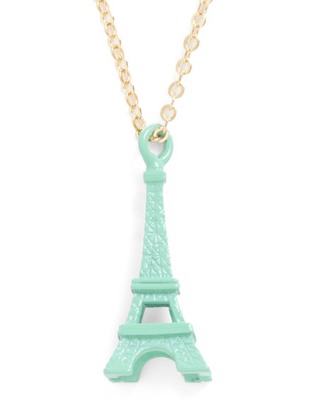 Mint Green Eiffel Tower Necklace- can't you just smell the croissants and eclairs, and feel the romance of Paris! This would be adorab;e for a little girl too! 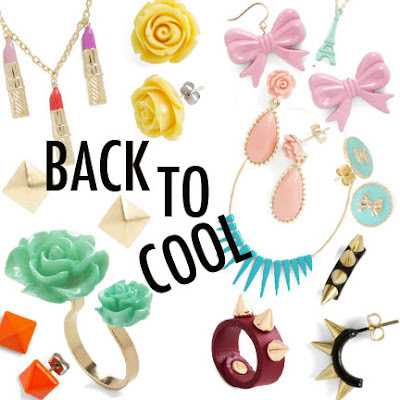 And there you have all my "back to cool", or "back to school" jewelry. Because sometimes all it takes is some fun accessories to give an old outfit a whole new look and feel! Wanna peek into KANDEELAND, CLICK HERE. Love Love, my fave's are the rose rings and earrings. 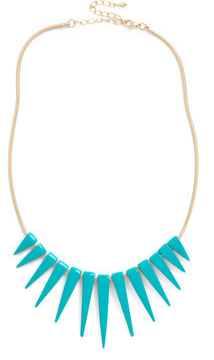 I also dig the spike jewelry. Thanks for posting! This is a great website thanks for sharing! Attack of the Beatle Boots! Who's That Lady on the Cover of Vogue!?! How Attractive and Beautiful Are You?